James Merritt spent years as senior pastor of an Atlanta-area megachurch that featured a mighty choir. Then he changed his tune. At 50, he left First Baptist Church in Snellville, Ga., to plant a new church — 200 people in a rented space at a high school 12 miles away — focused on reaching a young generation. There was and is no choir. And that puts Merritt’s current congregation, Cross Pointe Church, right on trend. A national study shows many Protestant churches are shedding the tradition of choir-led worship services. Photos used by permission from Bigstock.com. The newly released National Congregations Study finds church choirs are on the downbeat in white Protestant churches across the theological spectrum. Choirs stand strong in black Protestant congregations, where 90 percent of regular attendees say there’s a choir at the main service. The same is true for three out of four, or 76 percent, of Catholic worshipers. But among white conservative evangelicals, only 40 percent of worshipers say they hear a choir at services, down from 63 percent 14 years ago. For those who attend liberal or moderate Protestant congregations, there’s a similar slide to 50 percent in 2012, down from 78 percent in 1998. Sales for the music for choral anthems slipped so deeply four years ago that The United Methodist Church’s publishing arm, Abingdon Press, stopped buying new anthem music, said Mary Catherine Dean, associate publisher. A lot of thought went into eliminating the choir at Cross Pointe. “Practically, if a choir is going to be top shelf, people have to come at least one night a week and rehearse at least two hours. Then, a top-shelf choir is going to want to sing every service and do Christmas cantatas and special events,” Merritt said. Today, Cross Pointe, with nearly 2,800 people in weekend worship, is “a very contemporary, very band-driven church,” serving a multiethnic, multigenerational congregation at two campuses. Merritt’s reasoning mirrors that of experts who see choirs shrinking, if not falling silent. 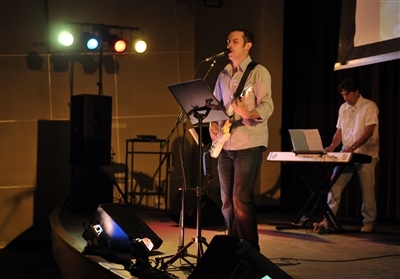 Praise bands playing contemporary music not only appeal to young audiences but often require fewer resources. People are reluctant to perform. Mary Preus, choir director at Our Saviour’s Lutheran Church in Minneapolis, blames “our culture of performance and expertise. We don’t sing anywhere else in our lives the way we once did. I grew up singing in home, in school and church every week. Now, people think they are not good enough to sing,” she said. On Sunday mornings, eight to 12 people and a hired soprano sing for about 80 people at services where, 40 years ago, a choir of 30 voices sang to hundreds in the pews. The recession was a blow. “Music is an area that can be cut when dollars are scarce in the (offering) plate,” painful as that may be, said Terre Johnson, national chairman for music in worship for the American Choral Directors Association. Thirteen years ago, when Joey Lott became director of worship arts for Maples Memorial UMC in Olive Branch, Miss., there were 55 voices in the choir. “In 2008 when the recession hit, I lost 15 members of my choir in six months. They had to move elsewhere for work. That started the descent. From there, I am now down to about 25 people,” Lott said. Yet choir leaders adapt and sing. And because traditional choral music can be challenging for even the most talented of singers, she takes time to hunt down more accessible music, often drawing on music from Africa and Latin America. Don’t count choirs out, said Eileen Guenther, professor of church music at Wesley Theological Seminary in Washington and former president of the American Guild of Organists. “Churches are struggling to find the style that is most engaging. But there’s a reason choral music is called ‘traditional.’ It’s been around a while. Contemporary music may not have as much staying power,” Guenther said. It may be that what is fading away is the “performance choir,” replaced by choirs that lead the whole congregation in song, said Charles Billingsley, worship pastor for Thomas Road Baptist Church in Lynchburg, Va., and artist in residence at Liberty University. “We are in the age of church planting, and a lot of these startups are small. But I see even some of these churches will throw up some risers and have 20, 30, 40 people sing,” he said. * Cathy Lynn Grossman writes for Religion News Service. Copyright 2014 Religion News Service. Used with permission.